Patellar tendon tears are a relatively common and severe tendon injury. Patellar tendon tears will require surgery in order to enable you to walk or return to sports again. Florida State quarterback Deondre Francois went down early in the 2017 season. He has a patella tendon tear and will be out the for the rest of the season as he recovers from his patellar tendon tear surgery. There are many ways to tear or rupture your patella tendon. You can slip on ice, fall downstairs or perhaps you simply felt your knee give out. In the case of Jimmy Graham of the Seattle Seahawks, he simply landed awkwardly. If you tear your patellar tendon you will usually hear a loud pop. When you try to stand up you will notice that you can not straighten your knee, and the knee will feel very unstable and weak. Why did the tendon tear? Why is surgery needed for patella tendon tears? 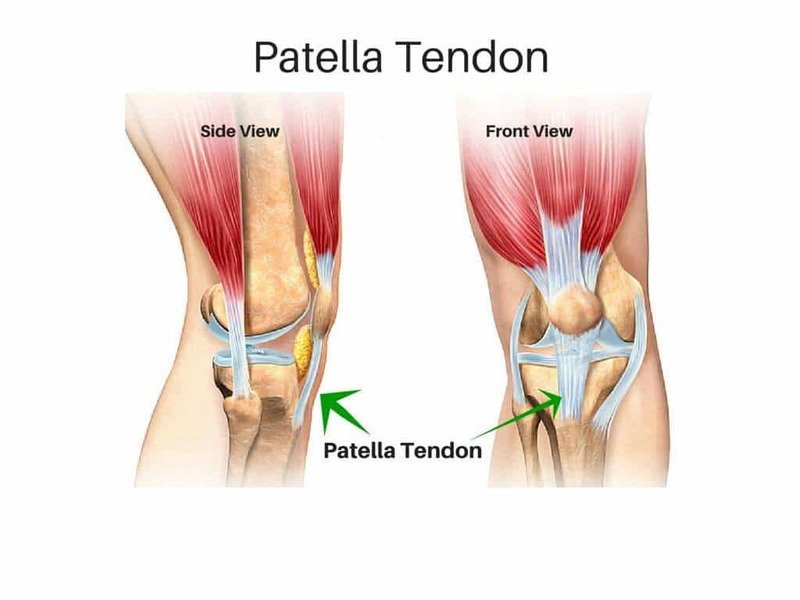 The patellar tendon is an extremely strong tendon (actually a ligament) that connects the patella (kneecap) to the tibia. The patella tendon is an absolutely essential structure for walking or running. When the patella tendon tears you can not straighten your leg… or if you can move it, you will find your knee is very weak. This is because a tear in patella tendon basically disconnects your powerful quadriceps muscles from the tibia or shin bone. That means that the quads can no longer straighten or extend your knee. Why is the patella tendon so important? When you try to straighten your knee – your quadricep muscles pull the patella, the patella then pulls the patellar tendon which in turn pulls your tibia or leg forward. The side view of the patellar tendon above should help clarify that. The patella tendon can degenerate or wear out like most other tendons in our body. Some of you might feel as if your leg simply gave out. That means that the tendon tore causing you to fall. Others have slipped on ice, fallen down the stairs, or took off to sprint after a ball on the basketball, football or soccer field and felt a pop. The patella tendon can tear for many reasons. The most critical step is what you do next. If you have injured your knee and your knee can not support you because it gives out and feels weak then you may have torn your patella tendon. You will immediately need crutches and a brace to stabilize your knee and prevent injury from recurrent falls. After your emergent treatment you will need to see an Orthopedist, preferably a Sports Medicine specialist trained in the management of soft tissue injuries. An MRI will usually be ordered to confirm where the tear in the patella tendon is. Is Surgery Necessary for Patellar Tendon Tears? Surgery is always recommended for complete patellar tendon tears. If your patella tendon is not repaired, you will not be able to walk without your leg constantly giving way. For professional athletes this is a severe season ending injury. This is due to the need for a lengthy recovery following a patella tendon repair. At the time of surgery, your patella tendon will be reattached to the patella. During the surgery we place sutures in the patella tendon. Those sutures are then brought upward through a few holes in the patella. When we tie the sutures the patella will be brought back down to bring the torn edges of the tendon together. Many of us will also incorporate additional “tension relieving stitches” so that we can start an accelerated rehabilitation protocol to get you up and walking faster. It can take nearly a year to recover from a patellar tendon tear. Surgery will lead to significant stiffness and quadriceps weakness. Therefore the recovery process will be long and require a lot of effort on your part after the tendon heals and the physical therapy and recovery phase begins. Having an Athletic Trainer or Physical Therapist work with you soon after surgery is important. They will start quadriceps activation exercises to minimize the amount of atrophy which will occur. The risks of patella tendon surgery includes infection, stiffness, and developing blood clots in your leg. The risks are low, but never non-existent. If you believe you have suffered a patella tendon tear, reach out to us or a local sports medicine professional as soon as possible. Any significant delay in your surgery can effect the overall results — which are generally excellent. Can I Return To Sports After A Patella Tendon Repair? A full recovery from a patella tendon repair will take 8-12 months. Professional athletes like Jimmy Graham should be able to return to the field after 8-9 months or more of extensive therapy. Many non-professionals can expect to return to an active lifestyle nearly a 8-12 months after a patella tendon repair. Twenty three years ago I had a LAD graft ACL reconstruction using my own patellar tendon. It has served me well and at 55 years old I have a pretty solid knee. Unfortunately, I heard a pop on the same knee while playing volleyball last week. My GP thinks I ruptured my patellar tendon. I can still walk, straighten and bend my knee with little pain. I have an Orthopdedic appt next week. Are there times when surgery is unecessay to repair the tendon ? Where can I find more information about this injury? My volleyball days may be over but I’d like to stay active. You would know if your tore your patella tendon. Without pain, swelling, weakness etc it is unlikely that you suffered a significant injury. Good luck with your appointment! Hello Dr. Luk’s I have had patella tendentious for awhile now and it seems not to go away and every time I got to the doctors to get a chech up on it all they say is ice and rest but I been doing that for years and exercise they I learn from therapy in 2010, which my therapy sessions didn’t help. Its 2015 now and it is still a problem what suggestion do you have for me? I was told that PRP injection don’t work any intake on that? Actually Jerry … we have had significant success in treating patella tendinosis with PRP injections. Other options are PT with “submaximal eccentric loading” :-), a Tenex procedure and the last option is traditional open surgery. Hi Doc Luks just had an Mri of my knee found a 50% tear on my patella tendon should I stop playing and training or is it safe to continue? That’s a significant tear … I would not be playing sports.. nor running up the stairs, etc. A jumpers knee is not considered a tear… it is a process known as tendinosis. Some radiologist might mistakenly call it a partial tear. PT can be very effective in managing this. Eccentric exercises are key. many months… the surgery is fairly simple and straightforward, but there’s a ton of PT and rehab afterwards before you confidently get back up on your feet. Hi Howard, I am a college student who has been suffering from knee pain for the last 20 months. The pain slowly increased to a point where it hurts to even run 1/2 a mile, or even walk much more than that. I mostly experience pain where the patellar tendon attaches to the tibial tuberosity, but some under the kneecap as well. I had an MRI which only noted a degenerative posterior horn medial meniscus. My PT said that was normal for someone who was active at my age. My ortho ended up diagnosing me with PFPS. My question is, can PFPS elicit pain from the tibial insertion point of the patellar tendon? Also I looked at the MRI myself and noticed there was some white signal where the patellar tendon attaches to the tibal tuberosity. Could that be indicative of a partial tear? Should I have another MRI done to get a better picture of whats going on? Thank you for your time, I am really just wanting to cure this so I can get back into sports. Without seeing you and the images I really can’t say. Signal changes are not always unusual around the knee. They need to be put in context. I assume your surgeon looked at the images too ?? Tibial tuberosity bursitis, or tendinopathy in that region is possible. The treatment plan would depend on what I thought the problem was. Perhaps another opinion is in order. A good exam is better than a good MRI. Hello my 14 year old son ruptured his patellar tendon from his tibia playing football and had it repaired the next day. He loves sports especially football will he be able to continue these activities once rehab is complete? Is there a higher chance of re rupture since it’s happened before? These questions are really for my wife and I he thinks he’s invincible and will be his old self again. He was very good at football I have watched the film of the play several times and seems like it was a fluke accident. Is this a rare injury for someone so young? Thanks for any answers you can give. very rare injury. Not sure if there is published data on recurrence in this age group. Hi! On July 18 2015 I was on a trampoline trying to slam dunk a basketball ring. Ended up rupturing both my legs patellar tendons. At 8 weeks my left has a 70 ROM bend and my right has a 55 ROM bend. I’m a 46 year old male from Melb Australia. 1. Is my ROM bends within acceptable recovery range after 8 weeks timeframe? 2. How long should it take me to get to 130 to 140 ROM. 3. Will I ever reach full ROM? 4. Is there any one out the that has done both tendons at the same time. 5. Taking Deca Duraboline roughly 2ml a week as I heard that Deca or even HGH may speed up recovery time. Not sure if there’s any truth to it. 6. Are CPM effective for increasing ROM? 7. Yday I injured both legs by over training or over forcing the stretching. Set me back 10 degrees on both legs. Doing 45 min stretching on each leg 4 sets a day. Set back has mentally brought me down. Do sure how I should exercise. 2. How long should it take me to get to 130 to 140 ROM. It’s impossible to anticipate that. Steroid injections are very much frowned upon for the patella tendon … or the quad and achilles too. They can lead to problems and best to avoid. Without examining you and looking at your studies I couldn’t comment further on the treatment possibilities. Good even Dr. Luks. I have a partial tear in my patella tendon. So far ive had 2 prp injections and just recently a stell cell injection. I receive this injection yeaterday morning and the pain was overwhelming during that night.. My knee was thobbing everytime i had to move including turning over in my bed. Was that normal? It feels a lot better today but i still cant extend or bend my knee. I didnt have this problem with the prp injections. Is that normal also? If also bought a knee stabilizer to help keep my knee straight for about a month. Is that beneficial to the tear healing? most cases of a jumpers knee … or patella tendinosis will be read by the radiologist as a “partial tear”. But the underlying issue is patella tendinosis… not patella tendonitis. Hopefully that helps you search the proper terms … since rehab works in most of these cases. It takes a long time… many many months before you can plan on returning to full activities. Hello doctor, my 20 year old daughter had a patella ligament tear 3 weeks back. Her knee just buckled while standing. Fluid was drained from her knee to reduce the pain and swelling. She is unable to straighten her knee and walks with a limp, using a knee cap. She does not have too much swelling or pain, but gets tired very fast if she has to walk. Since she is studying overseas, can you please tell me what precautions I can ask her to take? Also how long does it for the tear to heal? And when should she start physiotherapy? Any exercise that can help ? Thank you for any answers you can give. Sorry.. that’s too vague. I patella tendon tear is a serious injury. Was it confirmed with an MRI? I just turned 40, fell on some stairs and tore my patellar and tendon. I had surgery 1/12 I am due to start PT 2/9 but my knee is very very stiff. I cannot even think about potentially bending it as it feels like rock? Is this normal? Or perhaps its scar tissue or infection in the knee? No real pain but I had a block and I feel like the random pains I sometimes get post op are related.Please advise, thanks so much. It is very common for these injuries to produce significant stiffness… thus the early PT. When should someone start PT after a ruptured patella? Many of us start PT within the first two weeks, some might wait longer. You need to check with your surgeon an abide by their protocol. Hi , I ruptured my patella tendon 2 weeks ago and have been scheduled for surgery on Friday. Can the delay in treatment he the operation cause problems in the long term. Will I be able to get full rom and will I be able to play hockey again ( field hockey) Any advice is greatly relieved. Thanks. Is shouldn’t theoretically have an effect.